Braces are an incredibly effective way to correct teeth and jaw issues, but caring for them properly is an important part of the journey. How well you look after your braces go a long way towards getting the results you’re hoping for, and make that day they’re removed all the more special. 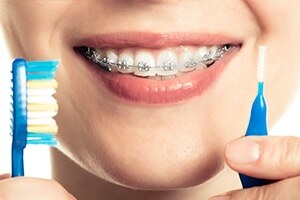 Taking care of braces may sound difficult, but it’s very simple if you follow the right steps. Here is an easy guide to maintaining your oral health with braces to prevent damage and give your smile the best chance of success. The basics are very important when you get braces. There are so many small places for food to become trapped as you eat, which causes plaque that can lead to more serious dental problems. For that reason, your daily routine is key to a healthy mouth while braces are on. Dentists recommend you brush after all of your meals, even snacks and smaller things. Like it might sound excessive, it will stop food getting stuck and building up over time. Be gentle when you brush, and make sure you get a soft toothbrush if you don’t have one already. This will go a long way to protect the wires and brackets in your braces from potential damage that could become costly later. Flossing should be performed at least once a day to keep everything clean as well. Be very gentle with the flossing, and take care to thread it through the wiring of your braces before getting started. Move back and forth slowly, and don’t use too much force with it. Rinse your mouth out at the end to pick up anything loose. Your orthodontist will provide you with a list of do’s and don’ts when it comes to food and drink. Be sure to follow this carefully. This will generally include anything overly sticky, chewy, or hard. Caramel and hard candies can become a problem, as can popcorn and pretzels. The list is not long, but it’s critical you stick to it to avoid getting anything chipped, broken or cracked to avoid complications. When you have any kind of orthodontics treatment, you need to consider what you put in your mouth – which doesn’t just include food. Chewing your nails, biting edges of pens and crunching down on ice can all cause issues that aren’t worth the hassle. It may go without saying, but ensure you keep up your regular appointments to the dentist or orthodontist so they can check your progress and make adjustments. After the braces are fitted it’s common to feel tightness or even a bit of discomfort or pain. If this persists, it’s a good idea to contact your orthodontist immediately. As well as adjusting your braces, your clinician can help keep your oral hygiene up with professional cleaning. This can include fluoride treatments and other routine procedures. They’re all critical to keep your health in top notch and allow your braces to do their work correctly. You can be as careful as humanly possible, but sometimes things may break or fall off. If the issue is serious, get in touch with your orthodontist and book an appointment as fast as possible. However, it’s good to know there’s a few things you can fix yourself if you need to. If a wire, bracket or spacer becomes loose, you may have a little more time. Loose wire can be repaired sometimes by using a spoon or stationary eraser to nudge it back into place. If it’s causing pain, put a cotton ball over it until it’s fixed properly. Ask your dentist or orthodontist for methods to temporarily repair any parts of your braces. Orthodontic wax can be used to reattach a bracket or cover a sharp wire. Be sure to discuss this with your specialist regularly and report anything that may feel like it’s in need of attention. You can still run out on the field and take part in sports with braces. However, you still need to take extra care to ensure you don’t end up with any broken parts. When playing contact sports always make sure you wear a mouth guard that fits your teeth. Ask your dentist or specialist about mouth guard fitting suitable for orthodontics. Note however that they normally don’t provide the same level of protection as more heavy duty guards do. If an emergency happens while playing sports, get off the court and book an appointment with the specialist as soon as possible to get anything fixed (or better yet, avoid contact sports where possible). For help with your orthodontics or to learn more about braces treatments, contact dhealth today.